I know, I know, I’m a little late here. I actually took notes this year on my mom’s stuffing and am getting this on the internet before I forget. Her stuffing isn’t crazy or wild or terribly gourmet. But it is delicious, amazing, traditional and worthy of fighting over. Every year someone says we should mix up our usual recipes and try something new, but yet, no matter what changes on the table, this stuffing is there. Even edging out whatever the latest “gourmet” stuffing might be tried out. You can make it 100% vegetarian, or you can go a little more traditional by using turkey giblets. I’m adding them in below separate from the recipe, so just keep an eye out for that. I also made this recipe on a random week night. It was insanely easy and would be perfect for company since you could get it ready the day before or morning of and just refrigerate it. And because let’s face it, who will ever be disappointed that you served homemade stuffing?! The onion-celery-buttery goodness. You don’t want to brown them, just make them soft. Preheat oven to 350. Prepare the giblets if you are using them. Spray a large casserole pan with non-stick spray. Melt butter in a large saute/frying pan. Add in the onion and celery and cook until the veggies are nice and soft. 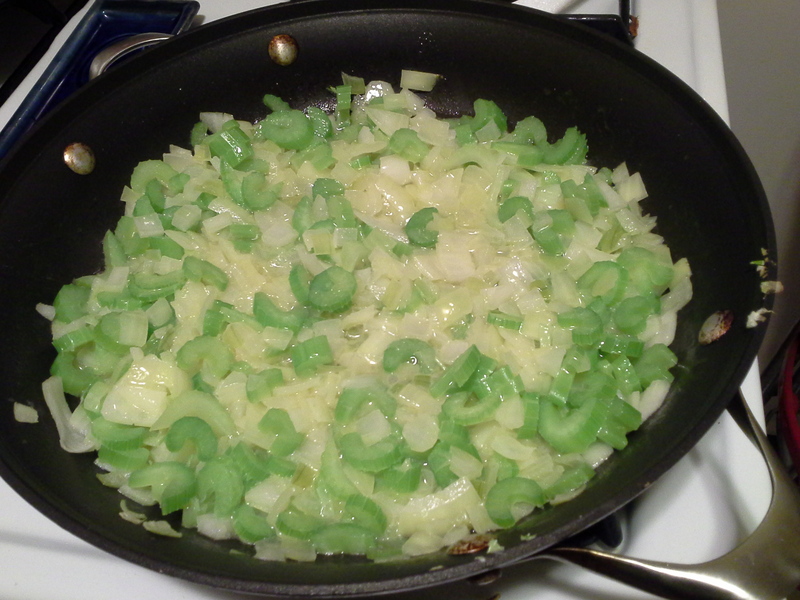 Mix the onion and celery in a large bowl with the stuffing mix. Add in a splash of milk (if you don’t feel like measuring but throwing caution to the wind – go for it). Add in about half of the chicken broth and mix very well. If the bread is still dry, slowly add more broth and mix until the whole thing is nice and moist. But there shouldn’t be liquid sitting in the bottom of the bowl. 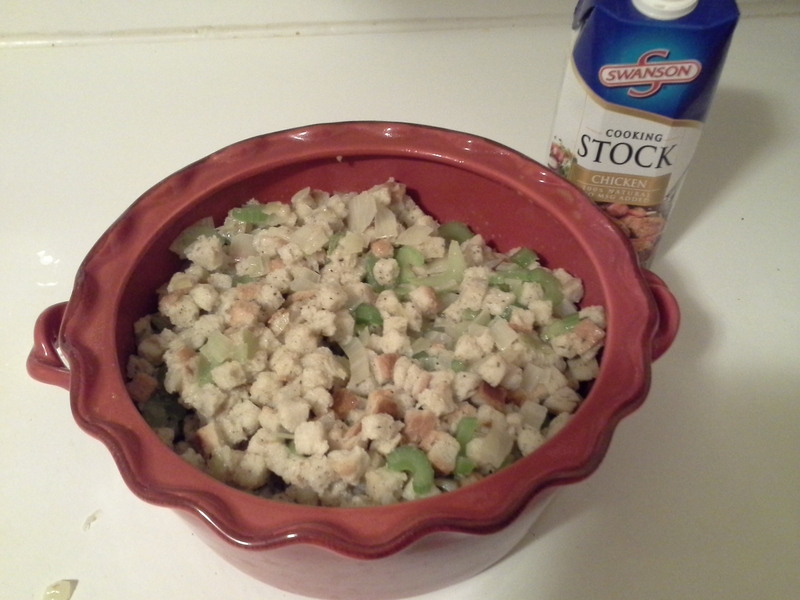 The stuffing right before it goes in the oven – moist but not soaking wet. Transfer to the prepared pan. If you want to make this ahead of time, get to here, cover it with foil and set aside until you’re going to make it. If you do this, you may want to splash some more broth on it before adding to the oven because it will dry out a bit as it sits there. Cover with foil tightly. Bake for 45 min or until nice and hot. Serve while warm. 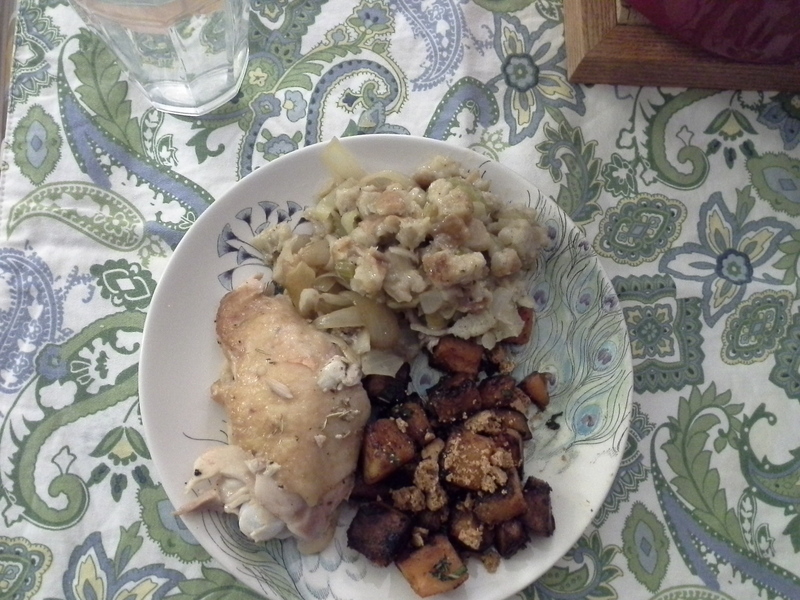 So the giblets are the extra turkey bits you get in your turkey. If you’ve ever made a turkey, when the moment comes to reach inside, you sometimes are unpleasantly surprised with a bag of goodies. Those goodies are the giblets. Sometimes the neck is in there too. Here’s what you do with them. Put the giblets in a small pot just big enough to hold them. 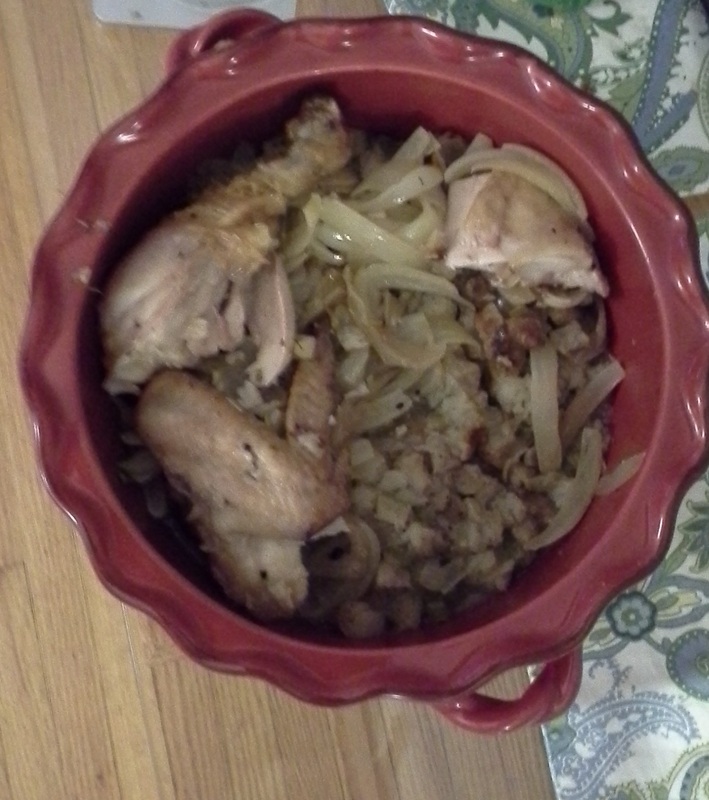 Cover with chicken broth. Bring to a boil, then reduce to a simmer for at least 20 min, or until they seem to be cooked through. Drain, reserving the broth to use in the stuffing (because it will be the tastiest broth). Then put the giblets in a food processor or finely cut them up. If you have the neck, see if you can pull anything off of it, but don’t feel bad if you just chuck that. The liver and whatnots are the best flavoring.